The preset Resistance program is the most “bang for your buck” among the training programs. By activating both Type 1 and Type 2 muscle fiber types, you can help to maximize the muscle contraction and get the greatest strength gains. Although this program can be used as a stand-alone routine (yes, even while you sit on the couch!) it may be best utilized in conjunction with some body weight exercises such as squats, push-ups, or calf raises depending on what you want to train. By taking your body through range of motion during each contraction, you’ll get even more benefit of the program to help increase your squat, vertical jump, and increase muscle mass! The moments immediately following a tough workout can be some of the most critical for recovery in a number of ways. Using the Active Recovery program within thirty minutes of your workout can help reduce lactic buildup, muscle soreness and fatigue so that you’re better prepared for the next session. By starting at a higher frequency and gradually tapering down, this program can be used as an effective cool down method. In the hours and days following a workout, using the Recovery Plus program will have the most benefit to ensuring your preparedness for the next session. Using a low frequency pulse, this program helps to increase local blood flow back to the muscle tissue to help keep it mobile and fight muscle soreness. A perfect rest day choice, stick on your electrodes for a relaxing weekend as you plan out your next week in how to continue towards your goals. 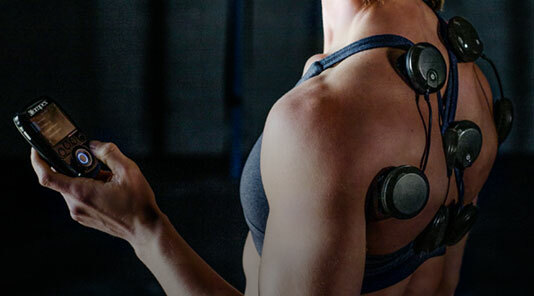 We know you’re ready to put in work this New Year and Compex is here to help meet your fitness goals. Train, recover and PR with Compex into 2018! 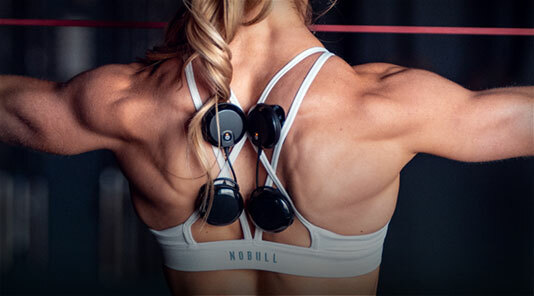 Your Compex device, which utilizes NMES, can be used to help build muscular strength and endurance, promote muscle relaxation and decrease recovery time. But could it do more? We think so! 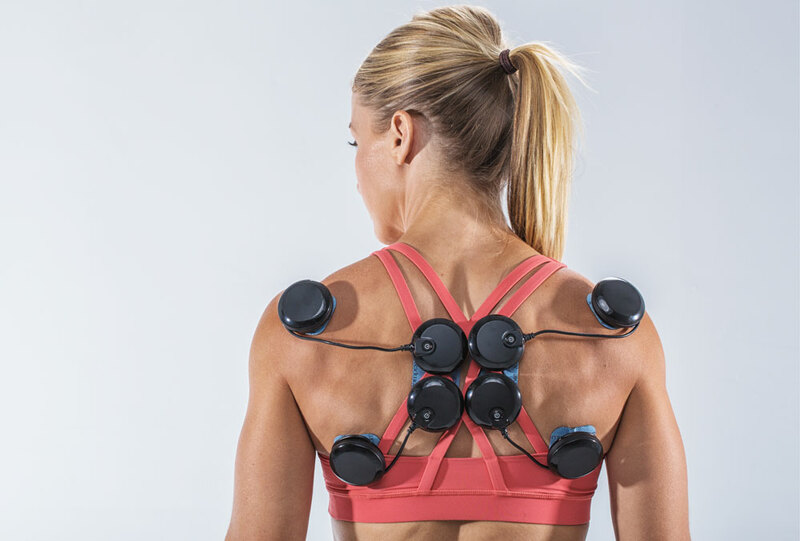 Our new device, Compex 2.0, offers a TENS program to further the benefit of your device by affecting the sensory nerves to help treat pain. If you’re experiencing pain from an injury or event, the Compex with TENS can help to maximize your training and recovery. So what’s the difference? Though both NMES and TENS may appear the same at surface level, they actually offer very different stimuli. A TENS device is designed for treatment of pain by inhibiting the receptors that our brains perceive. By targeting the sensory nerves, a TENS device is able to “trick” the mind into ignoring pain for periods of time. TENS units are also believed to release endorphins to further fight the mechanisms of pain. 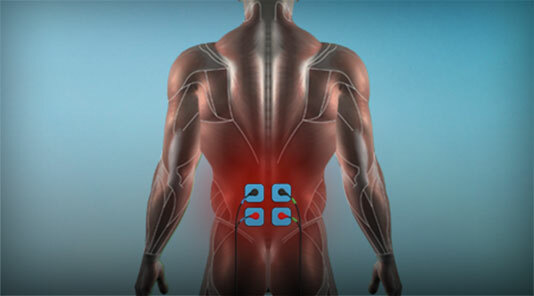 A TENS device might be used to treat individuals who suffer from chronic back pain, or who are managing acute injury. An NMES device uses frequencies that activate actual muscle fibers. By exciting the tissue, an NMES device causes similar stimulus to the muscle as would a workout. 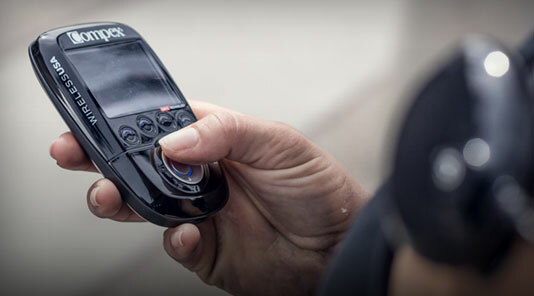 Depending on the frequency, NMES devices can target either slow or fast twitch muscle fibers. This means that a certain program could help to enhance endurance-based musculature versus those necessary for a power athlete. This allows a user to mimic and add to training to gain muscle size, strength and reduce risk of injury through proper warmup. 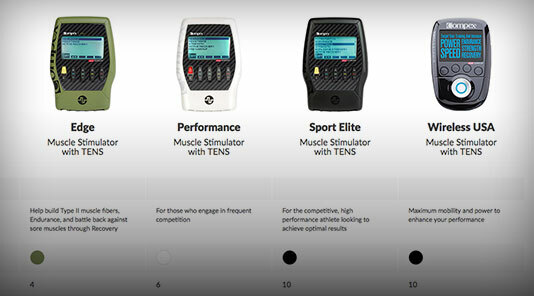 TENS and NMES devices work differently based on the types of nerves they target in the body. Where TENS targets the sensory nerves responsible for transmitting pain to our brain, an NMES device targets the motor nerves which allows for benefit to training and recovery through the muscle. 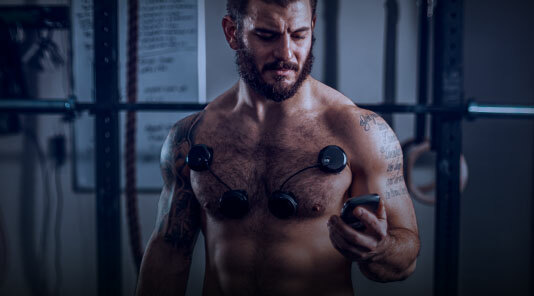 Where you may have needed two different devices for these effects before, Compex 2.0 maximizes the functionality of your device with both TENS and NMES functions. Phil Heath is preparing for his 6th defense as Mr Olympia in Las Vegas this weekend. Early this year we got to peak into his training program and spend some time on set for our Compex photo shoot with the legend himself. The Granite Games have been in play since 2013, in their fifth year of action, the level of competition continues to grow. Some of the fittest athletes will converge onto St. Cloud, Minnesota to compete alongside one another as they fight to earn their piece of the $100,000 prize purse pie! 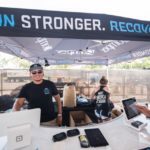 While the athletes duke it out on the competition floor, the spectators will have an opportunity to stock up on the essentials from sponsors like Rogue and Compex. The event will take place on September 8th through the 10th at Saint Cloud State University. The goal is simple, celebrate athletes of every skill level. The Granite Games will host over 1,900 athletes in the heart of central Minnesota! In addition to offering a weekend of competition to the community, Granite Games gives back. Every year, they aim to support the growth of the fitness community both locally and nationally. 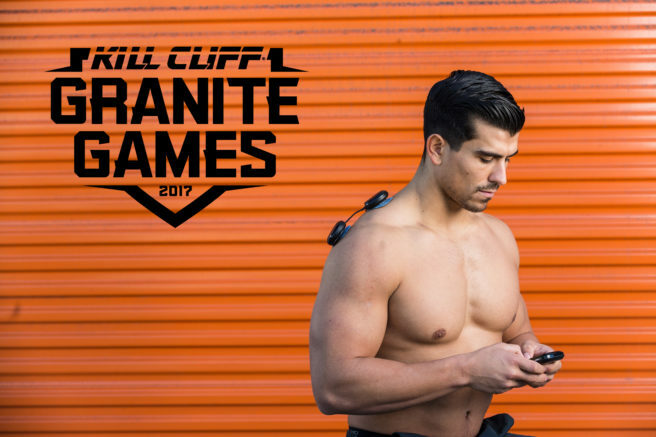 From offering Fitness Education Scholarships to outfitting gyms with Rogue equipment, Granite Games aims to support the growth of the fitness community both locally and nationally. The more experienced I’ve become as a competitive athlete the more I’ve learned to not only recognize, but prioritize, my recovery. As a high school and collegiate athlete, many of these realizations came through anecdotal experience or loose “research” (let’s agree that the magazines at the grocery store checkout shouldn’t be where you look to for reliable advice). 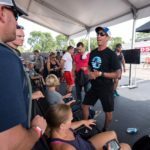 Over the years, however, with increased levels of experience, maturity and influence, I’ve fully adopted the respect that recovery is due in a culture overdone and beatdown by unending “hard work.” One of the most significant factors to a lifetime of recovery practice has been through improving and growing in my understanding of the ultimate fuel - nutrition. 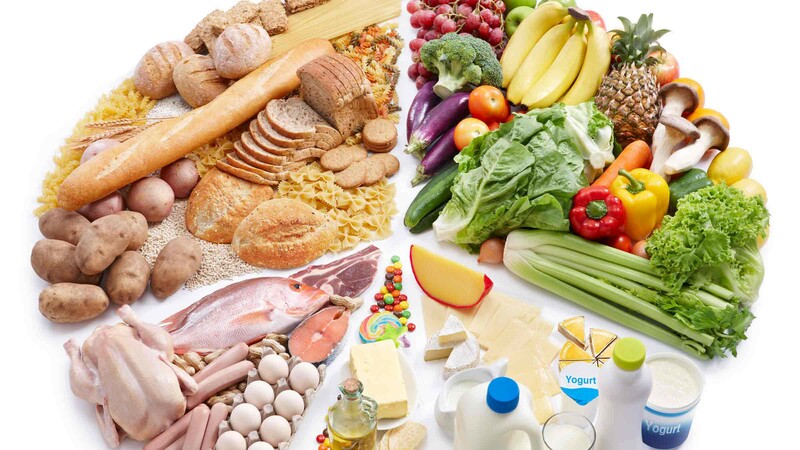 There’s are an overwhelming number of resources, supplements and diet programs available when it comes to the world of “nutrition” and the task of finding the best option for any individual can be confusing or discouraging. For that reason, I’ve narrowed down to a few of the most valuable areas based on some of my own experience as I’ve navigated myself through this process, most deliberately in the past few years as a competitive athlete and fitness professional. As you go through your training session, your blood glucose and glycogen stores are reduced and are responsible for the feeling of fatigue and low energy immediately following a workout. In true glycogen depletion, an athlete will experience what many call “hitting the wall” or “bonking” which can be a miserable experience for the individual in which the body no longer has fuel for the desired performance. Refueling blood glucose during and immediately after a tough workout is invaluable not only to recovering from the immediate session, but for future activity as well. High-glycemic and easily digestible carbs, such as a dextrose powder, are an effective way to refuel and replenish blood sugar stores for maximal recovery. The post workout protein shake isn’t just a gimmicky habit of meat heads with shaker bottles. To maximize muscle growth and repair tissue damage, the period of time immediately following a workout, commonly referred to as the “window of gains,” is a crucial time in regards to the relationship between nutrition and recovery. Practice taking in about 15-30g of protein, ideally in liquid form so that it digests quicker, within an hour of your training sessions along with some of those carbs! Some may say they sparkle, but athletes sweat. A lot. Whether you’re actually producing droplets on your forehead or it’s dripping down your arms or not, the highly charged body of an athlete is especially prone to the effects of dehydration and can suffer in performance as a result. When we sweat, we lose a lot of the mineral salts in our body along with the actual volume of fluids. Total hydration, therefore, isn’t just about replacing the water that your body has lost but also the electrolyte balance. Supplementing with electrolytes, especially for a highly active individual, can be vital to optimize balance and recovery. Much of the modern Western diet ranks poorly in the relationship of Omega-6 to Omega-3 fatty acids in our bodies which has resulted in chronic inflammation. Supplementing with fish oils can be tremendously effective in balancing these ratios, reducing inflammatory responses, and improving health and performance as a result. Omega-3’s are considered “essential” because we can only get them from our intake - our bodies can’t produce this by itself. Since our diets lack more natural sources, such as fish, supplementing these vital fatty acids with fish oil capsules can help increase muscle growth, inhibit tissue damage, reduce muscle soreness, increase immunity to disease, and even improve cognitive, heart and lung function. It might seem easiest when you’re rushed to go through a drive-through or grab the easiest “healthy” option off the grocery store shelf, but understanding the role of nutrition as fuel to your body is an undeniable truth to increasing athletic human performance. The effort you put towards learning how to optimize your recovery from within will repay you more than you’re due for a healthier, stronger life. 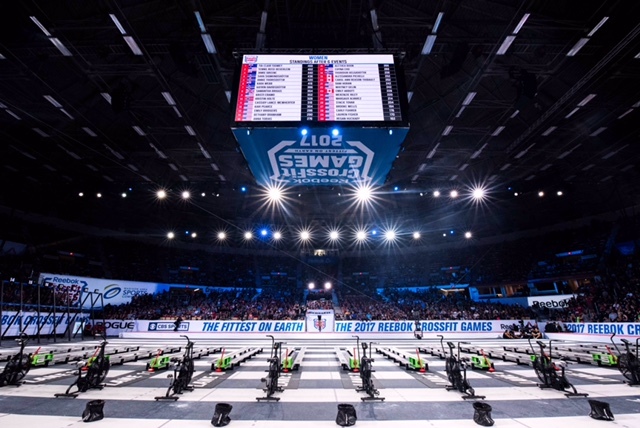 2017 was the first year the CrossFit Games was held in Madison. It proved to be an exciting location, packed full of new events for the athletes. The enclosed stadium allowed the crowd to be louder than ever, and the obstacle courses and weather provided additional challenges for the athletes to overcome. A big Thank you to our Education Staff who worked all weekend, providing demonstrations of our muscle stimulators to the spectators and athletes. 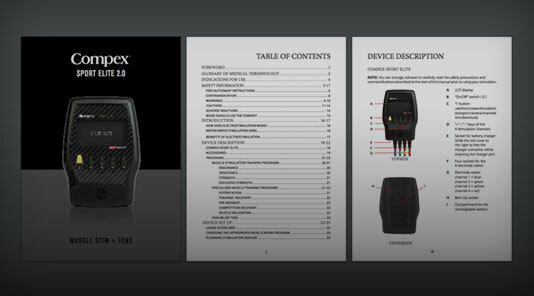 Todays tip is all about the wavelength we use at Compex® and what makes it unique. Make sure to follow all safety instructions before beginning any new exercise program, and always be aware of your progressions based on your activity level. Please visit www.compexusa.com to learn more. 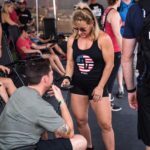 Check out the latest Compex® blog written by 1st time CrossFit® Games athlete and Compex athlete Sarah Loogman, where she interviews her Invictus teammate and Compex Athlete Lauren Fisher. If you’re a fitness fan, chances are you’ve heard of Lauren Fisher. At 23 years old, Lauren is an accomplished professional CrossFit athlete and internationally competitive weightlifter. 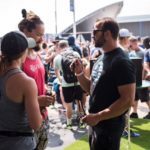 Battling back from a surgery following last season, Lauren will be making her 5th appearance this year at the 2017 CrossFit Games, hosted for the first time in Madison, where she will compete against the “fittest on earth” in a four-day competition that tests athletes endurance, strength, athleticism and will power. Despite her young age, Lauren has placed herself among the CrossFit elite with top performances including a 9th place finish at the 2014 international CrossFit Games and 1st place in the 2016 California Regionals. As a weightlifter, she claimed the 2014 USAW Junior National championship in the 63kg category and earned the Best Overall Lifter award. On the international stage, she earned a bronze medal in the clean and jerk at the 2014 World University Championships. Needless to say, she’s pretty fit. What has been one of your greatest obstacles that you’ve had to face, either as an athlete or in your personal growth? How did you overcome it and what was the greater lesson that you’ve learned that allows you to be who you are now? I think the biggest obstacle that I had to face actually happened this past year. After the 2016 CrossFit Games, I knew something was wrong with my ankle and I got an MRI right after the Games to find out that I had a 2cm longitudinal tear in my peroneal tendon and an ostechondrial lesion that needed repairing. I couldn’t run and push off my ankle without pain. August 30th, 2016 I had ankle surgery. The doctor said I would be out for 5 to 6 months which meant I would be back just in time for the Open, but my conditioning and strength numbers would be nowhere near where they were the previous years. I was able to grow mentally as an athlete during this time. My goals this year had shifted to just making it through the Open, then qualifying for Regionals and now making it back to the Games. Looking back, I thought this year was just going to be a growing year and I wouldn’t even be able to compete but I did just that and surpassed my expectations. I think this helped me understand that if you set your mind to something, you can do anything. Don’t let one little obstacle get in the way of your goals. There is always something meant to come out of any hard situation and I think for me it helped me realize how grateful I am when I am able to compete and train healthy. No one likes to be injured, but I’ll tell you what I got a really strong upper body out of it. There is obviously a lot of sacrifice that comes with elite performance so where do you most find reward in what you do? What’s the “light at the end of the tunnel” that you look to or that you would encourage others to look to when things get tough? For me, I love what I’m doing and I love trying to be the best athlete that I can be. Since I don’t play sports anymore, CrossFit has been my outlet to have fun and be competitive. I love all the people I train with and every single one of us pushing each other to get better. I think that’s what gets me going when things start to get tough. I have to remind myself how lucky I am to have this opportunity to train for a living and travel the world. All the long hours and exhausted nights are worth it when you’re out there competing on the biggest stage. 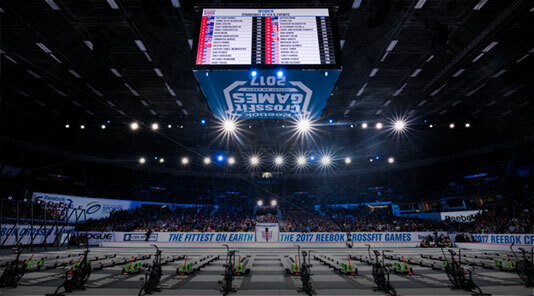 What are your goals or intentions for the 2017 CrossFit Games? For the 2017 Games, my goal is to leave it all out on the floor every single workout knowing that I had nothing left. If I can do that, I will be happy with my performance. Obviously, a top 10 finish would be nice. What are a few of your most important daily habits, aside from training? Aside from training, my nutrition is very important to me. I weigh and measure all my food so I can make sure I am getting in enough calories during my long training days. Rehab exercises, stretching, and reading all make the list as well. How do you maintain balance to your life, or do you? What are some of the non-training of non-CrossFit things that are most important to you and how do you manage those things, values, or relationships? I definitely have balance in my life. I think if I didn’t have any balance that training wouldn’t be fun to me anymore. My family, boyfriend, and friends are all very important to me and they understand what I’m doing so its very easy to balance my relationships with training. I think a lot of people don’t know that I love to bake desserts. When I was little, I wanted to start my own bakery. I’m already planning the things I want to bake after Games and enjoy! Lauren recently graduated with her degree in Business Marketing from San Diego State University - congratulations, Lauren! 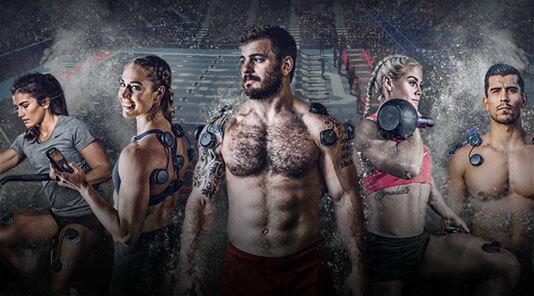 The researchers behind your Compex® device have been able to create highly effective training and recovery programs using electric stimulation and highlighted the best of technology into the programs you find on your personal device. Each program contains it’s own unique programs but among those used for training, one program stands out: Resistance. The Resistance program begins with a pre-warmup phase to prepare the muscle by gently increasing blood flow. The “working” portion of the program rotates through cycles of a more intense contraction phase, followed by an active recovery phase. After the last cycle, the program finishes with a cool down phase to ramp down the activity of the muscle fiber. 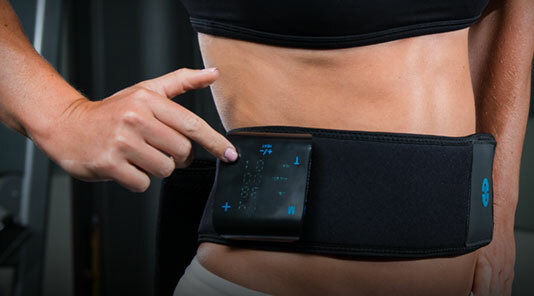 The Resistance program is one of the strength programs offered in personal Compex devices and is found in all four devices. The program targets both Type 1 (“slow twitch oxidative”) and Type 2a (“fast twitch oxidative”) muscle fibers. Although slow twitch is generally associated to aerobic performance, such as long distance running, and fast twitch often credited to power athletes. Most people are about 50/50 in the division of slow and fast twitch muscles so general fitness enthusiasts, especially those who train in CrossFit-like methods, will benefit most from this program. The Resistance program could be used as a stand-alone training session or in conjunction to your regular routine. Although you could literally sit on your couch and benefit with some muscle activity with your device, the most effective way is to take your body through a controlled range of motion while using the device. Common practices would be to perform bodyweight or lightweight squats with electrodes on the glutes, hamstrings, or quads or to exercise an upper body pulling exercise with placement on the lats or mid back. 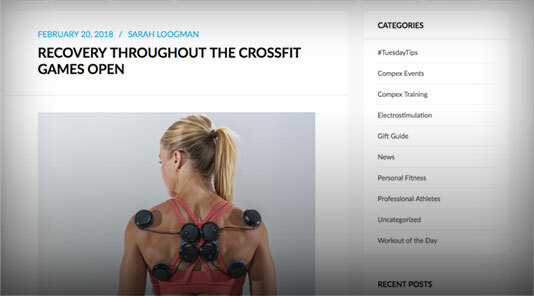 You can find many of these recommendations on the Compex website or blog! An “electric stimulation device” might seem extreme, but the use of electric currents to activate the muscle can be a powerful tool made available through scientific understandings of our body and is becoming increasingly more mainstream among both fitness hobbyists and elite competitors. With programs such as Resistance in your Compex device paired with healthful living practices, you can achieve greater performance potential which can lead to a healthier and stronger self.